This morning, in lovely Georgetown� with unseasonably cool and comfortable weather for that swamp� (figuratively and literally) of a city, Washington, DC. 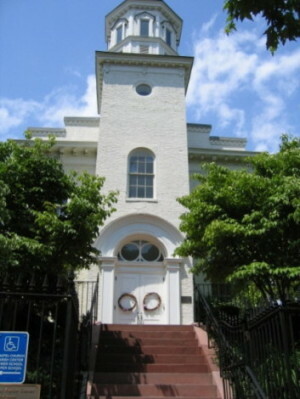 The first Roman Catholic church in DC, built in 1789. I did not intend to cut off the steeple in my photo.�The building�is now renovated as The Chapel of St. Ignatius Loyola as part of Holy Trinity Parish, which now has a new sanctuary on the corner of N St. built in 1851. The parish was started by Archbishop Carroll, who was also the founder of Georgetown University.�We cannot underestimate the role of the Jesuits in this nation's history. My graduating child, who is Protestant, of a�more-or-less�evangelical flavor, told me that Georgetown holds an outdoor Mass in front of Healy any time something wonderful, or anything�disturbing (including things like not winning in basketball) happens. As an approach to both the grim and the joyful vicissitudes of�life, I find that wonderful and rational. If I had but one wish with regard to education, it would be that every child had the opportunity to study in a Jesuit school. As a Protestant, I cannot disagree with you one bit. My former wife graduated from Georgetown, along with three of her brothers, who all ended up in the military for some reason. We got married in the Chapel on the campus and I used to enjoy visiting Georgetown when I lived in Washington DC.